The Highway 61 Blues Festival Poster Signing will be held on Thursday, May 27 from 5:00 - 7:00 p.m. at the Highway 61 Blues Museum located at 307 N. Broad Street in Leland. 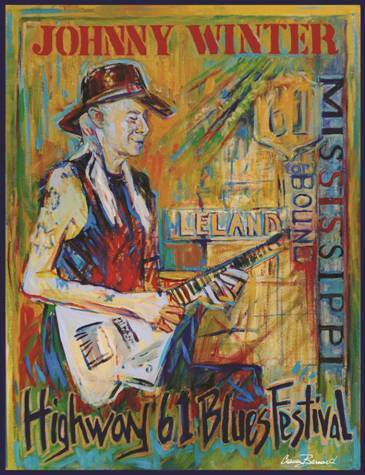 Artist Cristen Barnard designed this year’s poster that honors Johnny Winter. She will be on hand to sign and number posters that night. Wine and hors d’oeuvres will be served. Ryan Moore of Cicero ’s Restaurant will be serving his delicious fried catfish and pork tenderloin. Ellen Ann Johnson will be serving her many delicious dishes as well. William McGee, Pat Thomas, Eddie Cusic and T-Model Ford will provide the entertainment. At 7:30 p.m. the party will move to Lillo’s Restaurant for dancing to the music of Lillo’s legendary Thursday night band and dining. To reserve a poster call the Highway 61 Blues Museum at 662-686-7646. For reservations at Lillo’s call 662-686-4401.